Historical Romance At Its Best! GREAT introduction to the new “Covert Heiresses” series! Erica Monroe is going onto my list of “must read” authors after having read this book! I know she is a prolific writer but so far have only read a few of her books and each one has been an absolutely wonderful well written story! What a GREAT introduction to the new “Covert Heiresses” series! The Spencer family has been involved in secretly keeping their country safe for over a century. James and his sisters put country before anything else. Vivian Loren grew up in the home of a Viscount but was turned out with her brother when her cousin came into the title. When her brother was murdered she went into service as governess for the youngest son of the Spencer family and her life has been quiet and rewarding but also stressful due to the reason she is actually working there. Both Vivian and James have lost siblings and begin to bond after discussing their losses one evening. There is an ease and companionship between them but also chemistry waiting to be explored. Vivian needs protection and James has offered his to her. Little does she know that there is more under his expensive clothes and pleasant demeanor than a the wealthy Duke he appears to be. I loved Vivian’s strength of will, clarity of mind and determination. I loved James for his ability to realize his strengths and weaknesses as well as sensitive and tender side. Both characters were well written and the growth of their relationship was a joy to read about as it unfolded. A number of characters were introduced in this book that will no doubt have stories in this series later and I look forward to reading each and every one of them! Thank you to NetGalley and Quillfire Publishing for the copy of this book to read and review. I Spy a Great Read! Erica Monroe does it again with her unique blend of intrigue, danger and romance! Bringing two people together on different missions, yet in the end on the same. Vivian Loren is grieving from the loss of her brother and is determined to revenge his death. Obtaining information that she needs to ingrain herself in the Spencer family's home to find out who killed her brother, she lands a job as a governess. James Spenser is who she is to spy on and as the days go by, she realizes he is not the brigand he is suppose to be. James, the Duke of Abermont is grieving the loss of his sister who died as the result as one of his missions. You see James is a spy and is working to find out information of his own. In the end the two begin working together and as Vivian comes into danger, James will do what he has to to protect her from harm. A definite page turner to find out what will happen and you become enthralled as the characters are masterfully developed. What a great story and cannot wait until more of this series comes out!! 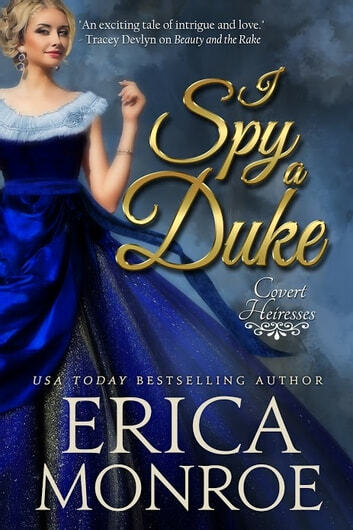 In this brand new series from author Erica Monroe, love blossoms in unexpected places as spymaster James uncovers the secrets of his brother's governess Vivian. Suspicious of her behaviour in his family's home, it doesn't take long for her to share with James that she's on a mission to track down her brother's killer, a mission that it turns out is in vain when she discovers that she's been coerced into spying on her employer for the perpetrator himself. With her life in danger, James' solution is simple - a marriage of convenience in which she'll get his protection and he'll have an excuse to attend London soirees on the arm of his wife, thus giving him a chance to tune his spymaster ears into the latest news while avoiding society matrons wanting them to wed their daughters. But with a killer after them, will the newlyweds find wedded bliss only to see it disappear? This is a new style of historical romance story for this author, who has previously published the Rookery Rogues series (not yet finished) which showcased heroes and heroines from the poorer sides of London. 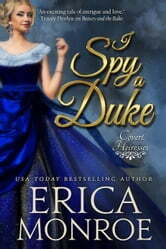 That series is one of my favourites in the historical romance genre so I was eager to see what she could do with the spy theme, definitely a popular subgenre. I found that this story was less intense than the other series but still an entertaining read. James and Vivian were both likable characters who've experienced the death of a family member under horrible circumstances. James' entire family is in the spy business, working for England to undermine Napoleon's rule and his sister Louisa met an untimely death on one of her forays. James' guilt over sending her out into the field has never left him, despite knowing that she was aware of the risks in her ventures, as any good spy is. As a result, when he first discovers that Vivian is being duplicitous and the reasons for it, his instinct is to come to her aid and the best way to do that, and solve his own marital problem is to offer her marriage. There is no doubt that they are attracted to each other (though they had both taken pains not to reveal this due to their positions) so they will be compatible that way. Their romance is a slow burn, and it's not until the second half of the story, once they are married that the scenes between them get steamy. Vivian comes across as an empathetic character, a woman who deeply feels the loss of her brother and is desperate to find his killer. When she's offered the chance to spy on James family in order to learn more about what happened to him, she feels caught between a rock and a hard place, but ultimately chooses her brother over any other loyalty. But when she is unable to discover the information that the man who first approached her wants, the threats turn ugly and turning to James is the only answer for her. Luckily, she finds in him the man who is the answer to her prayers - someone who will not only help her find her brother's killer, but also teach her how to defend herself, as now that she's marrying into a spy family, she is going to need to have those skills. And on top of that, she'll have a strong, supportive man in her life, one who quickly becomes dear to her. The second half of the story has most of the action and intensity, and builds up to the final conflict, but never fear, James and Vivian get their happy ending. This story moves along smoothly at a good pace, and contained interesting characters, also introducing James's sisters who will have stories of their own in the series. I'm looking forward to the next one! 3.5 stars.